Americans consume about 25 pounds of candy annually. That’s A LOT of candy, wouldn’t you agree? Want to limit your Halloween candy intake AND be awesome? Starting Tuesday, November 1st through Friday, November 4th, for every (gallon) bag of candy that you bring into our office, we’ll credit your account in our office with a $10 credit ($100 max please)! 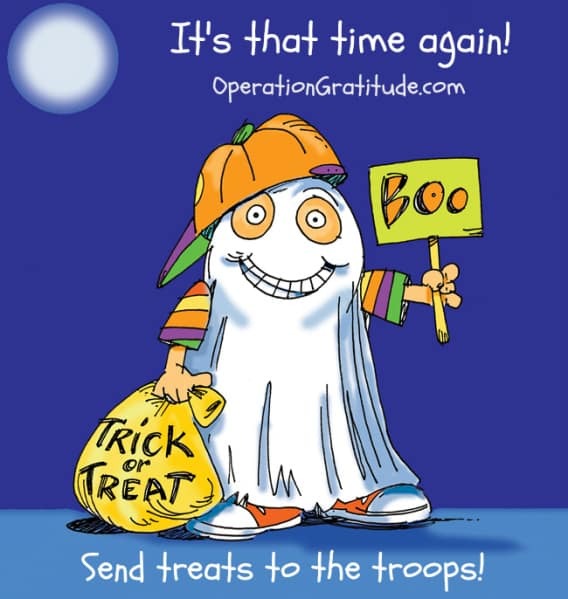 Getting credit is nice, but the awesome part is that our office will donate all the candy we collect to Operation Gratitude, which sends over 200,000 care packages each year to United States Service Members deployed overseas (to hostile regions, to their children left behind and to Wounded Warriors recuperating in Transition Units, and others). I hope that you’ll participate in “Operation Candy for Gratitude”, but we won’t fault you for sneaking a chocolate (or three). Enjoy. Indulge. Binge. Yes, I said, “Binge”. In the context of your dental health, it’s better that you chomp down all your candy in one sitting (perhaps for breakfast the day after), than snack on the same bag of candy over the span of several days. Drop off candy at either our San Francisco or South San Francisco office location.